When some of the neighbours seem irked at the Summer ban on lawn sprinkling, it may be some compensation to compare like conditions that existed, over many years, for the prairie pioneers. Naturally one might surmise there was no water problem at all in 1872, as there were only 11,467 persons, all told, in the Red River Settlement. Furthermore we might hazard a guess that at that time few, if any, had lawns to sprinkle. 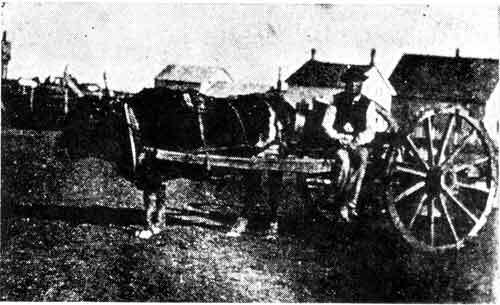 However, Fred C. Lucas in his Historical Diary of Winnipeg records, under "Trades and Professions," that the pioneer people in that era were served by a man listed as a "waterman," who peddled pails of water in a two-wheeled cart hauled by a clumsy bullock. Sergt. 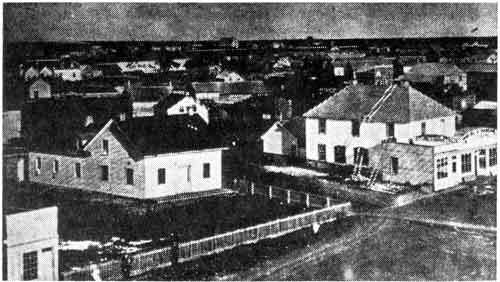 Irvine - Winnipeg Wafer Works - 1874. This primitive form of distributing this necessary commodity continued until the Spring of 1873, when, according to a press notice, we are told ... "Mr. George Rath is the proprietor of a new system of waterworks, which will henceforth supply citizens with the liquid element. The concern is mounted on four wheels, contains eleven barrels of water, and will be provided with forty feet of hose, by which means the water can be introduced into the houses of our citizens without the pail system. This travelling tank will be kept full each night to be used in case of fire. Rather good of Mr. Rath." Such vendors operated independently for nearly ten years. On March 14, 1881, a by-law was passed licensing water carts "to sell water within the City of Winnipeg  same being obtained from private springs." Such service continued until after the turn of the century when a commission was appointed on July 23, 1906, for the purpose of investigating the best available source of water supply for the city. Later, on October 30, 1907, the Board recommended Winnipeg River as the best supply  but owing to the Hydro Electric scheme being already under way the project was dropped until 1912, when the city again had an investigation made  this time the water of Shoal Lake was recommended. Finally, nearly thirteen years after the first findings of the water commission, on March 29, 1919, Shoal Lake water was turned into McPhillips Reservoir and distribution by the City of Winnipeg commenced one week later, on April 5. The great day had arrived, yet now, forty years later when the rains persistently pass us by, water-rationing continues, causing people in the even-numbered houses to cast envious glances at their odd-numbered neighbours watering their gardens across the street ... waiting, until their turn to sprinkle for three hours comes the next evening; meanwhile each group, in turn, enjoys the thrill of watching the lights come on as they use the hose, though it reminds them they must finish by ten. Strangely enough, those street lights too, in their graceful standards are now taken for granted. Who is there to remind us of the thrill, so many years ago, that came one night to the pioneers? They too, had their big moment when the proprietor of the Davis Hotel installed a street lamp in front of his place near Portage Avenue and Main Street. On March 6, 1873, the press stated ... "The lamp in front of the Davis Hotel is quite an institution. It looks well, and guides the weary traveller to a haven of rest, billiards and hot drinks, and lights up the streets probably more than the lamp of the newly-incorporated gas company will for some centuries to come." View looking south east from Main and Bannatyne towards St. Bonfface  1874. Approximately ten years later ... "the long expected electric light made its appearance on Main Street on the night of October 15, 1882; three lights being in operation, one at the corner of Broadway and Main, one in front of the Imperial Bank, near Post Office (now Lombard Street) and one at the Canadian Pacific Railway depot. The light factory was located at the Hudson's Bay Company mill near the mouth of the Assiniboine River." Finally, as we enjoy it, the Winnipeg Hydro-Electric Light and Power System was opened on October 16, 1911, by His Worship, Mayor Sanford Evans. Today their slogan reads ... "City Hydro is yours  use it!"